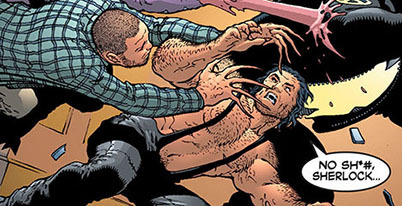 Powers/Abilities: Keratin was a mutant with the ability to grow clawed fingers, he could also retract them. (New X-Men I#116 - BTS) - After Professor Charles Xavier (secretly Cassandra Nova who had switched minds with her twin brother) came out as a mutant on live TV, the Xavier Institute was opened to the public. 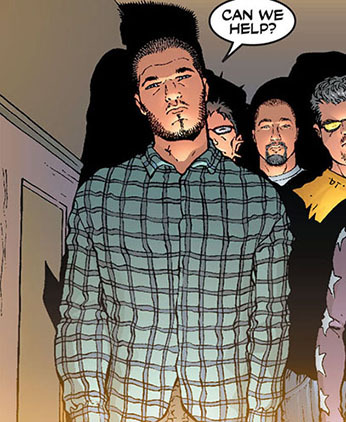 Dave was one of the many young teenagers that enrolled at the Xavier Institute. Because of his mutation, he took the codename Keratin. (New X-Men I#126) - Refusing to hide like a common human, Keratin and most of the students decided they wanted to join the fight against Cassandra Nova who at that point had fully manifested herself as a Mummudrai. Nova effortlessly used her psionic abilities to mind control Keratin and the other students, sending them to fight Beast and Wolverine. Keratin and the others were eventually freed from Cassandra's control by the Stepford Cuckoos. Comments: Created by Grant Morrison (writer), Frank Quitely (pencils), Tim Townsend (inks). He was of course named after the protein from which we grow our hair and nails. Keratin was most likely one of the many millions mutants who lost their powers when a reality altering spell cast by the Scarlet Witch reduced the number of gene active mutants to a mere 300 worldwide. Since all Xavier Institute students were selected to join special training squads mentored by members of the X-Men, Keratin could have been a part of the Excelsiors (Iceman's squad), the Exemplars (Beast's squad) or the Paladins (Shadowcat's squad) whose rosters have never been revealed. Keratin's name and code name have been revealed in the Xavier Institute entry of the Official Handbook of the Marvel Universe A-Z HC#13 (2010). Inside Info: His real name is a nod to Dave Finn, owner of Incognito Comics, who has helped provide me at short notice with many comics I needed for Handbook entries.